"Enjoy the mouthwatering ham leftover from Easter brunch in this fresh and delicious tasting spinach salad." In a small bowl, whisk together the oil, juice, vinegar, mustard and pepper. 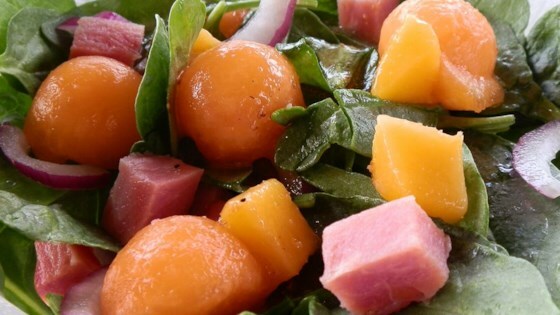 In a large bowl, toss together the ham, spinach, cantaloupe, peaches and onion. Pour dressing over all and toss to coat. Serve immediately.